"'A dark midwinter’s night in an ancient inn on the Thames. The regulars are entertaining themselves by telling stories when the door bursts open on an injured stranger. In his arms is the drowned corpse of a little child. 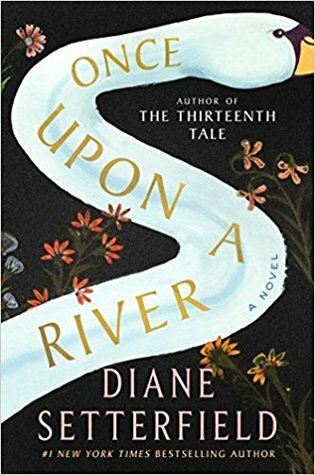 Once Upon a River was the most beautiful, cozy, and perfectly intriguing story that I've read in a while. This is a book that has all of the 'cozy up by the fire and listen to this story' sort of feel to it. It's wintry in its style, full of fully-fleshed and enchanting characters, and has a myriad of stories that all tangle up together and eventually unfold into brilliant cohesion. As much as I loved this book, I am almost unsure how to go about describing this because of how unique and enchanting it is. It feels largely like historical fiction, but there are some strong fairy tale and magical realism elements to it, including mentions of dragons (though admittedly they are not a big role). The writing itself is very much casual and takes its time to set the stage and introduce all of the characters thoroughly, which is something that I think really sets the tone for this book. The plot is centered around events that take place at The Swan, a local inn and pub-style location. At The Swan, storytelling is the main event, and locals take turns telling new and old stories. This really sets off the tone for the entire book and invites the reader to sit down and partake in a local story-in-the-making. The biggest location element that brings the entire book together is the River Thames, and I loved how Setterfield made this the central component of the book, and it truly does bring almost everyone's story together in one way or another. I could talk about all of the characters in this book for days, both because there are so many and because they are all so wonderful. That's not to say that all of the characters are wonderful people, but that the way they are developed and explained to us by Setterfield is done in such a way that I devoured every detail given about them and their backstories--all of which are very important and will probably come up at some point in the story. There is so much meandering of sorts regarding the characters' personalities and lives, but it all fits so well and doesn't feel meandering in a bad way. It's that perfect sort of wandering that's similar to when you're listening to a delightful story and you just want to soak up every single bit of it that you get. Some of my favorite aspects of this book had to do with the themes and ideas that Setterfield plays with. Everything is so real and rooted in reality, yet at the same time there is an ever-present sense of something... other in the air. Not a negative or spooky 'other,' but a sense of something supernatural that exists in the world, which is where the magical realism elements seem to take place. One character has an eye that can See people in the deeper sense of the word, the River Thames has a mysterious guardian known as Quietly--is it myth or reality? I loved this part of the book and the many different themes that came with it. There were also a lot of other big life themes at play that provided a lot to think about and that I think would make for a great discussion with others. Overall, I've given Once Upon a River five stars. If you're looking for a beautiful story with compelling characters and an intriguing storyline, then you absolutely need to pick this one up. This sounds quite beautiful. I love stories with magical realism. Yay, I'm so glad you enjoyed this book too. It really did have a cozy, 'read it by the fire' feel to it!